Executive Director of the Green Climate Fund (GCF) Héla Cheikhrouhou. Meeting ahead of the United Nations climate conference in Paris, the Green Climate Fund (GCF) Board, announced today that it approved $168 million of its funding for projects and programmes worth $624 million, marking the end of its launch phase and kick-starting the flow of climate finance to developing countries. In a press release, the Fund’s Board, which has been meeting in Zambia this week, said these new activities will generate up to $1.3 billion in investments over the coming five years. It noted that this initial batch of projects cover mitigation and adaptation measures; three of them are located in Africa, three are in Asia-Pacific, and two in Latin America. With climate finance being a critical element of global climate talks taking place in Paris at the COP21 in less than four weeks, the GCF is highlighting that the approval of the first project proposals marks a “major trust-building measure between developing and developed countries.” Countries reportedly have called for GCF funding to be delivered at scale to finance their national climate targets (INDCs). “We have come a long way to build the Green Climate Fund capacity completely from scratch over the last two years,” said Héla Cheikhrouhou, Executive Director of the Fund. 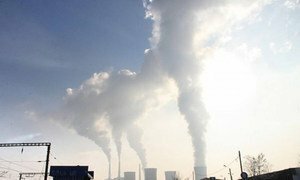 The Green Climate Fund, which was set up by 194 governments party to UNFCCC was given the mandate to help keep the planet’s atmospheric temperature rise below 2 degrees Celsius.